This is a game between two sides who are very much in the Playoff mix but the need for a win is much stronger for the away side than it is for the hosts. Both teams will want to win but the Turkish side are in fourth spot in the table while the Spaniards occupy the last Playoff spot, so their need for wins is evident. You can expect a great match here and it is a repeat of the semi-final from last season. The Turkish side triumphed in that game, only to lose the final, and these teams have a strong history of meetings in European action. This game is set to be the 19th time these teams have met and it is the Spaniards who hold the upper hand, with a 6-12 record at this point in time. The last time these sides clashed, earlier on in the season, the game finished 86-52 for Baskonia and there were three players grabbing at least 13 points each. Fenerbahce have been in fine form at home of late, picking up six wins from their seven most recent home games while the Spaniards got back to winning ways after a few defeats. The ingredients are in place for a riveting clash and it can only be hoped that the Thursday night Euroleague clash lives up to its billing. Ekpe Udoh has been a key player for Fenerbahce this season, offering an average of 12.3 points per game but he is a risk for this clash with a shoulder injury. If Udoh sits this game out, there will be a focus on Bobby Dixon to step forward, with an average of 10.8 points per game, and Jan Vesely, with an average of 10.6 points per game. Baskonia will look towards Rodrigue Beaubois, with an average of 13 points per game, Shane Larkin, with a return of 12.8 points per game and Toko Shengelia, who has provided an average of 11.6 points per game so far this season. 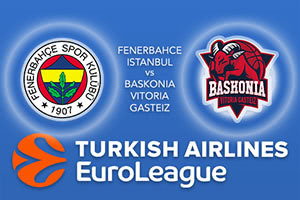 This game could go either way but back Fenerbahce Istanbul at -6.5, at odds of 1.90. You can enjoy the Over/Under market by going UNDER 156.5 at odds of 1.90. Bet Now!